With only a few minutes of prep, you could be exploring the universe with your favourite sci-fi characters, fighting the forces of evil with a party of talking chimps, or setting up shop as a modern day sorceress specializing in love potions. Maybe you're looking for the ideal pick up roleplaying game. Or you're a first-time gamer looking to try something new without investing hours of your time. Regardless, Fate Accelerated Edition will bring something special to your table. 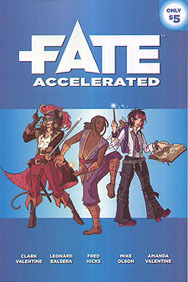 Fate Accelerated, or FAE, is a condensed version of the popular Fate Core roleplaying game that brings all the flexibility an power of Fate in a shorter format. Inside, you'll find a method for making fast, fun characters and simple systems to support whatever story you can dream up on the fly. With FAE, you can be playing in minutes.